Back for part two I see. Part one can be found here. Well we reached our #snackation destination for our Smucker’s staycation! Like I mentioned in the part one post, we live in a resort city and especially during the summer is when the beaches get very crowded, so we decided to go somewhere else that wouldn’t be as crowded. So I’ll introduce you to Mt. Trashmore and you can check out our picnic while your at it. Mt. 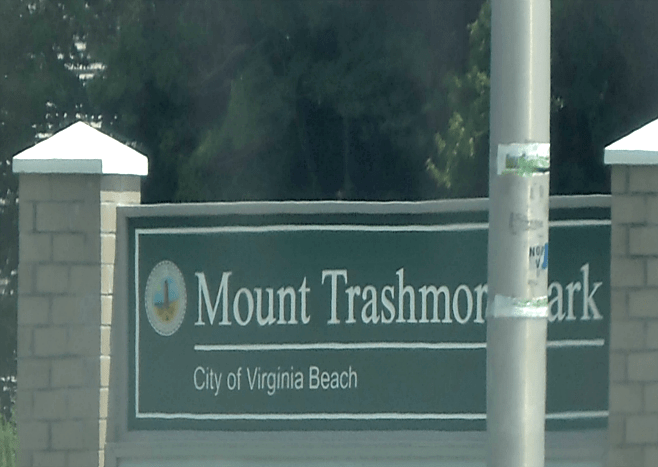 Trashmore is made out of grass and solid waste. Read more about it here. As you can see it’s pretty tall, so glad there are stairs! 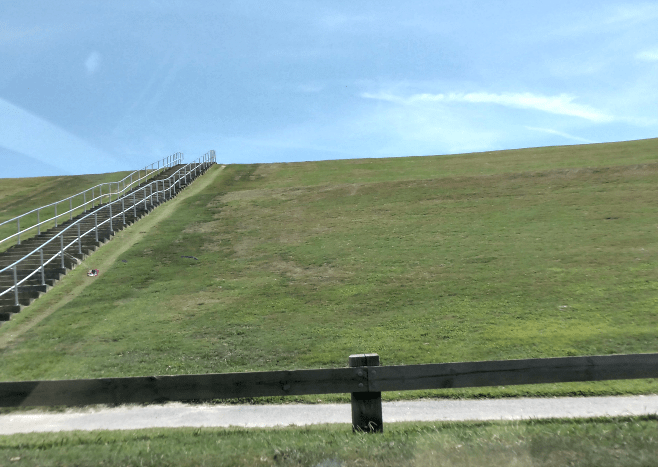 If your not a local don’t be surprised when you see kids at the very top either running down it or my personal favorite when I was a kid, laying down and rolling all the way down. People used to be able to slide down it when it snowed but too many people were going straight to the highway that’s in front of it and getting hurt, so now it’s against the law, and of course they have to remind people every time it snows! 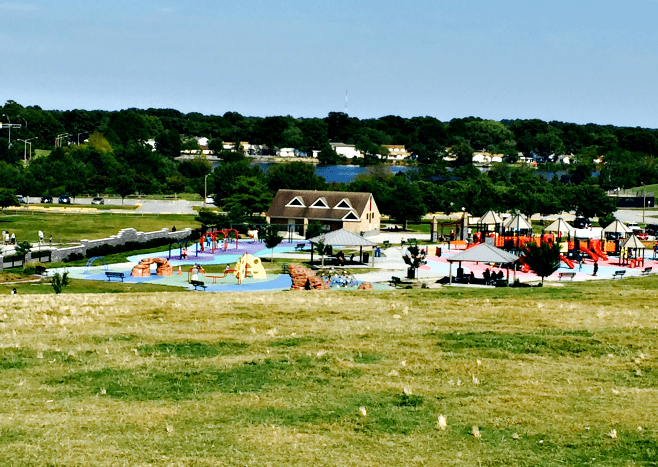 On one side is a playground called Kids Cove and a Skateboard park. Here you can see the playground from the top of the hill. Yes there were kids there, they just look like little ants because of how tall the hill is. On the other side of the hill is the picnic area. So that brings us to our picnic with Smucker’s. I had to make my teenagers’ sandwich as soon as we got there because he’s always hungry (growing and all that stuff that they do). And as you can see the one thing I forgot was the paper plates, sooo we made due with the plastic bags from our Wal-Mart trip. 😉 Just glad I remembered the knife, lol. 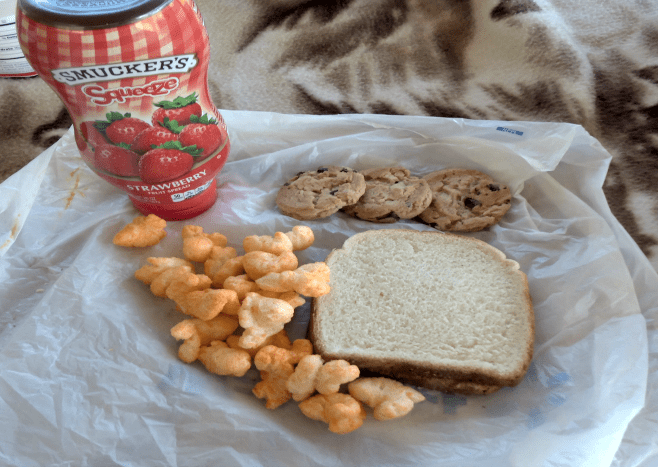 Plus, of course we had to get some cheese balls and cookies for our picnic. We brought chips but he didn’t want any, geez kids are so picky. My father came too and wanted me to take a pic on his motorcycle and caption it with “When I’m in a hurry and in a jam I reach for Smucker’s!” He’s such a dork! We had fun that day. It wasn’t as crowded as the beach would have been, plus the boys got to fly their kites at the very top, plus I got my walking in, still doing good on my diet. I’m still losing weight (50 lbs. lost and 2 pant sizes down). Well I hope you enjoyed our trip and learned something new! Smucker’s can be found at Wal-Mart. They have Reduced Sugar Jelly, jelly and peanut butter combined, and something new I noticed, now they even have plain peanut butter, never knew they made peanut butter. With the chunky peanut butter, you can actually see the peanuts in there! 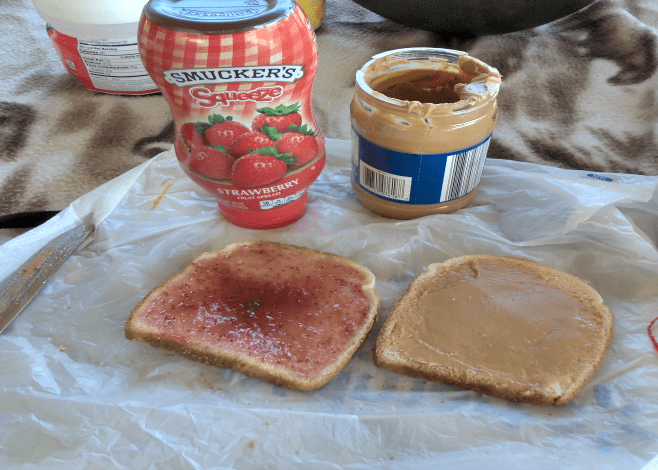 Comment below and let me know what your favorite Smucker’s Brand item is. « How Can Your Child’s Weight Affect Their Self-Esteem?